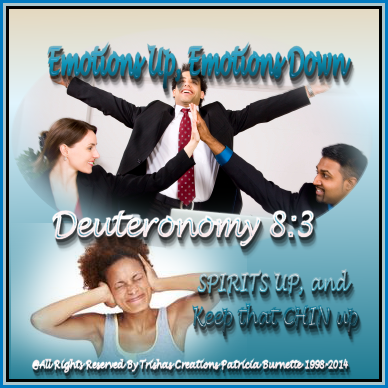 " Emotions Up, Emotions Down "
Welcome to " Emotions Up, Emotions Down "
Have you ever, I am sure you have, but have you ever been so excited about something so bad that you just wanted to shout to everyone of what happened that made you so very happy? Have you ever been where you had a feeling and emotions that just made you overwhelmed with so much happiness and peace of what you were experiencing and the devil pokes his nose in and starts his mess and makes you feel so unworthy? I don't know about you, but I know he has done this to me way to many times so many times I don't have enough fingers, toes or hairs on my head! So many times that I would get so disappointed and so frustrated and discouraged, depressed and no matter how hard I tried, no matter how many times or hours I spent at it, it's like the devil always has to poke his big nose in and mess everything up! He has went as far as keeping me sick all the time to stop my efforts of doing what I need to be doing. Off and on for over 2 years, the devil has caused me to drop in my efforts and my pattern which I was in, like the flu, a stroke, stomach bacteria, black mold poisoning, shingles, headaches so bad couldn't hardly hold my head up, he's caused fussing and so much arguing among the family and I am about to scream. It seemed like everything was happening and getting in my way of doing what I needed to do to get all caught up and getting back on the track I needed to stick to. The devil made me feel so unworthy, so worn out that it never seems to be enough for him to leave me alone. Everything from health issues, family issues, car issues, computer and laptop issues, you name it, it was more than likely hitting and boy the emotions which was going through my head and my heart, I was about ready to throw these hands of mine up.......... but of course I didn't do that, because I know that God brought me where I am and He will get me through what he has me doing, no matter how long it takes me to get there!!! I was taught anything that is good and it's for the Lord to keep pressing on and pressing in, because the devil will do whatever he thinks he can get away with he will try to stop it and that progress. I am a fighter in the sense that no matter what goes on, I am going to keep working at it, and make it work! God, is a wonderful Father, Master and King, and He sure wouldn't give me talents to use, if He didn't want me to use them for His Glory.... and the devil however, can kiss my grits and move on, because GOD IS IN CONTROL here and there is nothing the devil can do to stop me. There are times, when God allows us to go through things in our lives, not to punish us, but to help us to be stronger and make us a better person. He allows us to learn from our mistakes, the decisions we make whether they are the right ones, or the wrong one, He helps us along our way, to learnt to grow in Him to learn to make better judgments and learn to be all He meant us to be. It's not because we are not good enough , as to why we have problems in our lives, it's because we need strengthened and our emotions go up and down, if we let them. God's word helps us to stay focused, it helps us be reminded of his promises, which He made to us, it also keeps us on our toes, to tell the devil he can't touch us or have us! So keep your SPIRITS UP, and Keep that CHIN up, because we have God to help us and with His promises, we have our assurance that God will bring us through. If God Brought Us to It, He will Bring us Through It!!! Seek God No Matter what Always know He has your Back and your Front and Sides!! !